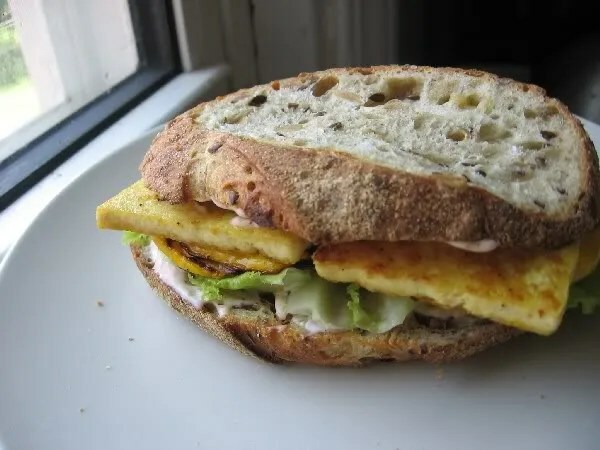 Now, I never went for a fried egg sandwich in the old days, but this really tastes good, and I’ve made it every once in awhile since the early vegan days, when my only vegan book was The Garden of Vegan. (Wow, imagine! No Isa/Romero yet!) So simple, yet so tasty: you just mix a tablespoon of nutritional yeast with 1/8 t. each of salt and pepper, dredge two slices of tofu in the mix, and fry in a bit of oil. It does taste kind of eggy, but in a good way. 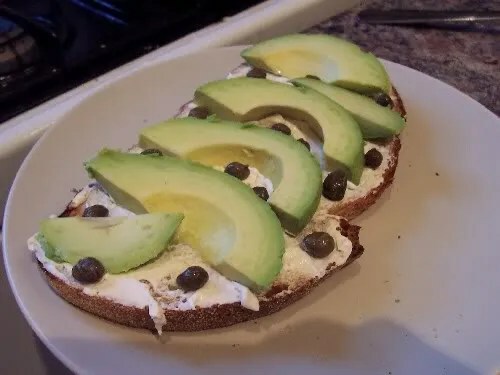 It mostly just tastes savory and good-for-a-sandwich-like. 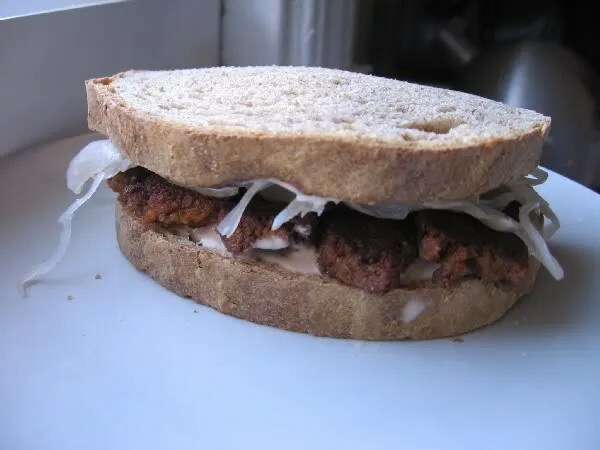 Normally I’m a little wary of seitan sandwiches: gluten on gluten is for once in a blue moon. But this was delicious! I had chorizo from Viva Vegan! in the fridge, and some sauerkraut and the last of the Wildwood aioli kicking around in there, too, and very little time on my hands to make lunch. To the last of the aioli I added a touch of ketchup and a touch of dijon, fried up the sausage, toasted the bread, and presto, I had a real treat on my hands! 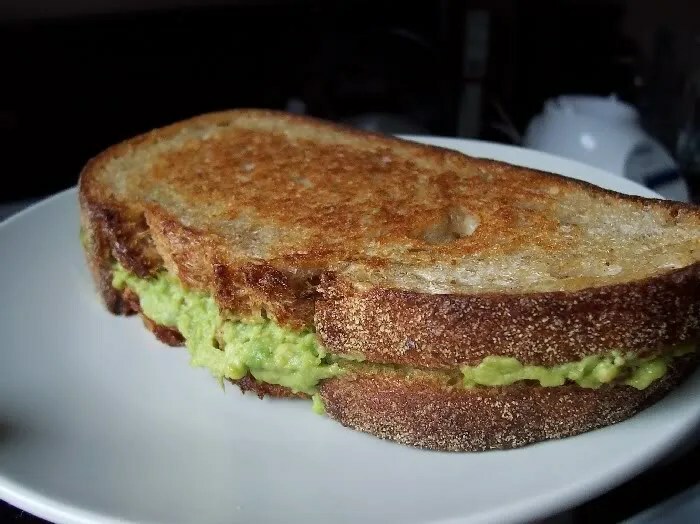 I used a bit of that Yoso cream cheese from the frosting to make a sandwich, with a beautiful avocado I had. And capers always seal the deal. After taking the photo I sprinkled on some salt and pepper, which always make friends with avocado in my mouth. 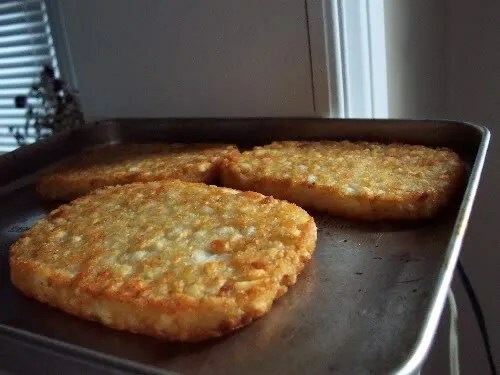 Below we have some Cavendish Farms potato patties fresh out the toaster oven. The Nutritional Facts panel got in a bit of a tiff with my oscillating chin. (I have these weird English/Irish/Scandinavian genes that make me gain weight only in my stomach and chin: I know, the most unhealthy body shape for heart disease, yadda yadda. Apple shape and so forth. Life’s too short to worry about it. Evidently. Plus I’m hoping with the zero cholesterol diet I enjoy, it might all come out in the wash.) But they reminded me of how much I enjoyed them on lazy carbfest days with my buddy Andrew throughout the year, so I bought them and ate them all in quick succession. Here’s a rather decadent sandwich: the Guacamole Griller #1 from The Uncheese Cookbook! 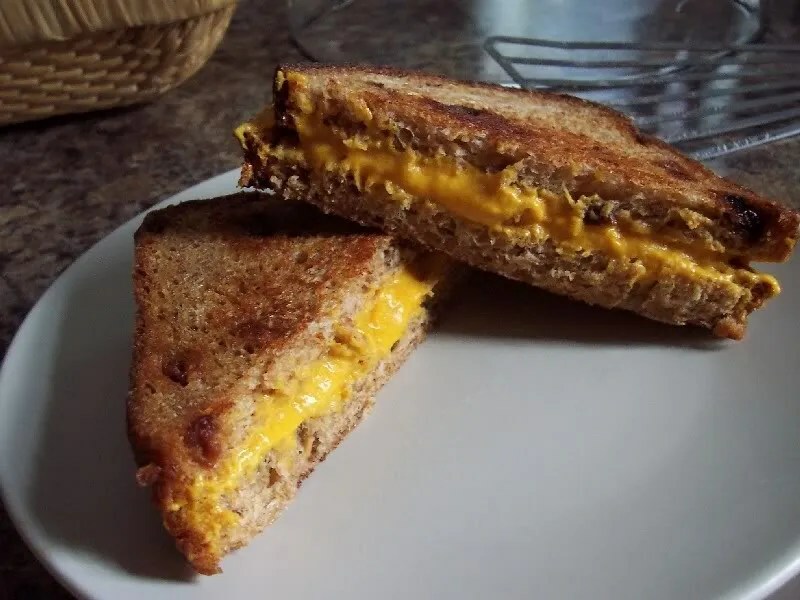 I’ve been making the Gooey Grilled Cheez Sandwich from The Uncheese Cookbook: above, we have it on raisin spelt bread; below, on rye. 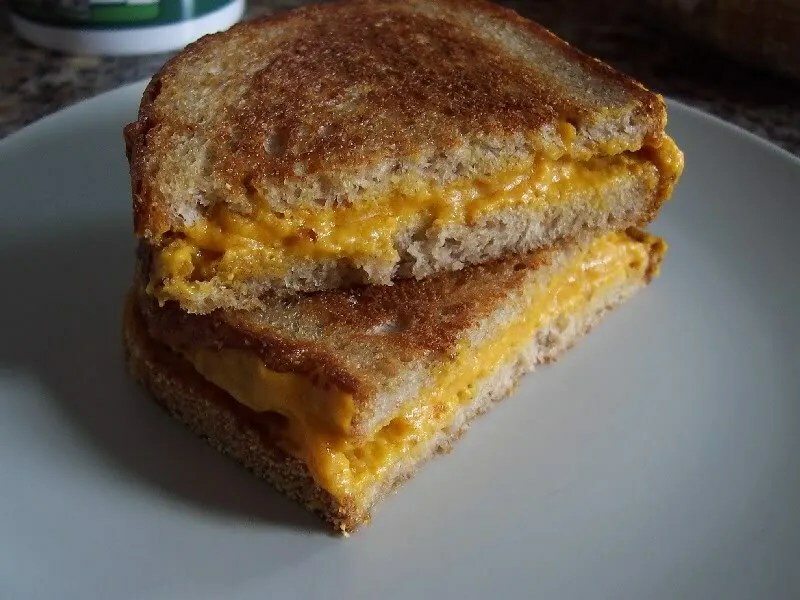 It wouldn’t fool anyone that still eats cheese, but I think it’s a delicious fall lunch: melty, crispy, tangy, very tasty. 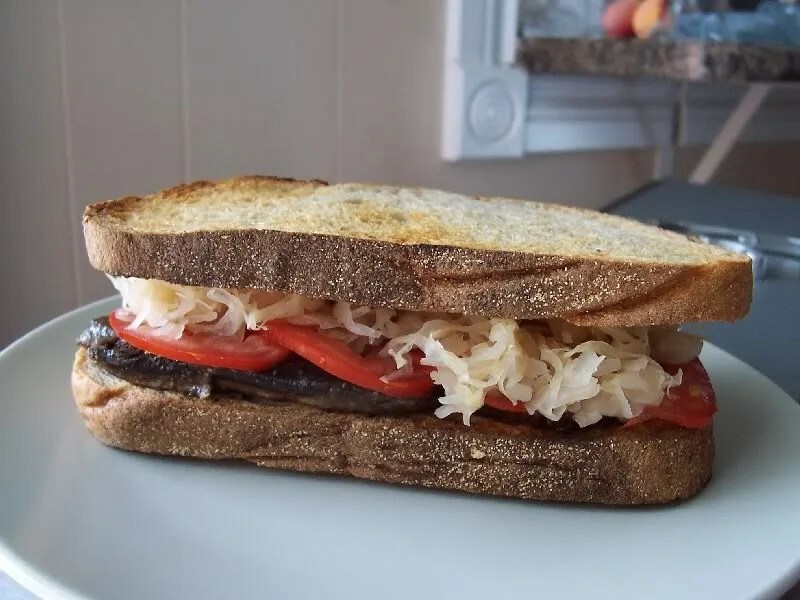 Today for brunch I made a tempeh reuben from Vegan With a Vengeance. Very tangy and filling! The silken tofu Thousand Island dressing is really good, and I regret having to leave out the capers because I’m out; then it would be even better. 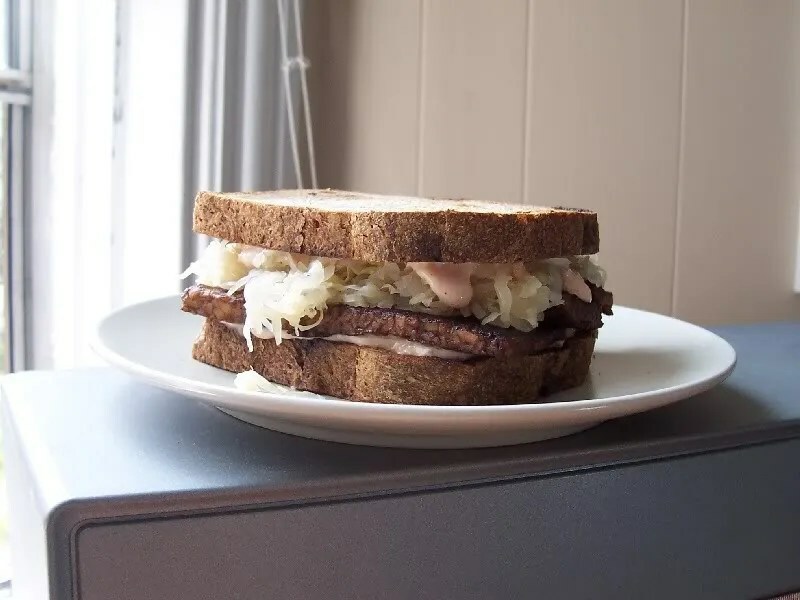 Sauerkraut and Indonesian satay somehow make sandwich magic. Sandwiches are magic anyways, but still.